Nail Art Competition and Giveaway with Lynnderellas! Ladies - It’s competition time! 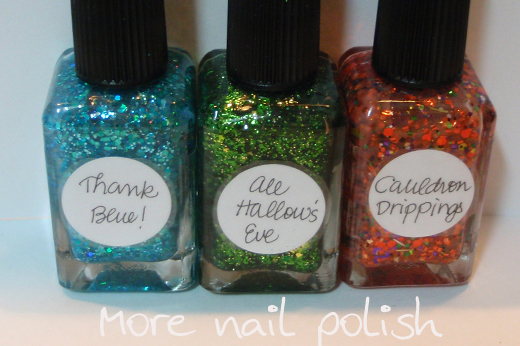 Next month is my two year blogiversary so I wanted to hold a giveaway with some special polishes I have. But I didn't want to make it too easy for everyone. None of that “follow my blog” for an entry business this time! Nope, you have to make a real effort for an entry. That's because the prizes are pretty cool. I want to see nail art ladies. And I’m pretty sure I can convince you to enter. I’ve done a few mani’s where I have been inspired by something. 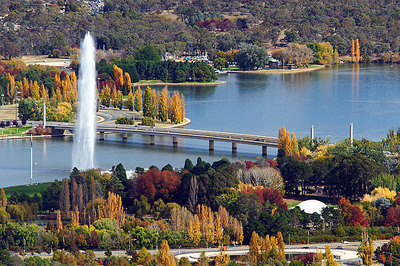 Was inspired by Canberra in autumn. Then I did my red camo design, inspired by my kevlar motorcycle pants. This this design inspired by Miss One's jumpsuit. 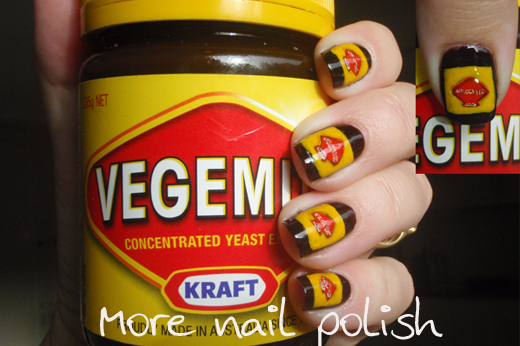 And my delicious Vegemite nails. All you need to do is come up with some nail art that is inspired by something. It can be a real object (like the jumpsuit, pants and Vegemite above) or is could be more artistic and based on a scene or feeling. It can really be based on anything, as long as your nail art represents it in some way and you can provide a picture of what that inspiration is. Full details on how to enter are available in the fine print below. There will be THREE prizes – That’s right, THREE amazing prizes. 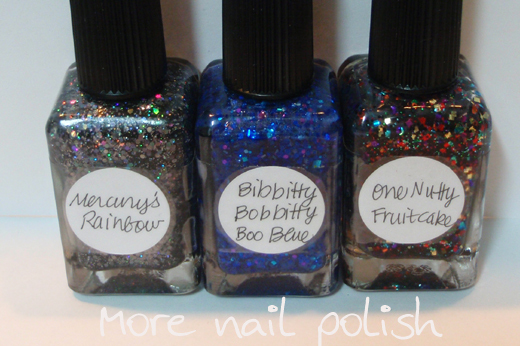 Three brand new bottles of Lynnderella nail polish. 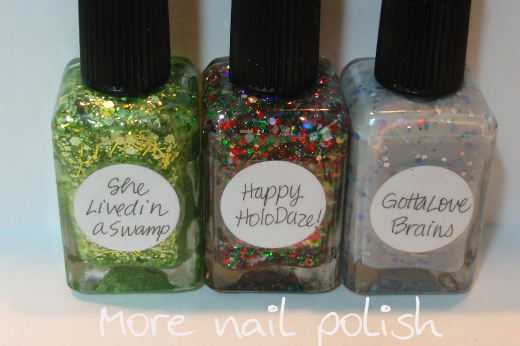 She lived in a swamp, Happy Holo-daze and Gotta love brains. Prize one will be awarded to the winning nail art as selected by a panel of judges that includes my husband, my mum and other members of my family. Thank blue, All hallow’s eve and Cauldron drippings. This winner will be RANDOMLY drawn from all the AUSTRALIAN entries. Aussie Gals, this means you just need to enter your nail art to have a chance to win. This winner will be RANDOMLY drawn from all the INTERNATIONAL entries. International ladies, this means you just need to enter your nail art to have a chance to win. Get out there and find something that inspires you. You must email me your photos by 11.59pm on Sunday 11 March 2012. As long as it's before midnight on Sunday 11 March somewhere in the world, I will accept your entry. Up to two photos may be submitted for your entry. If two photos are submitted, one must be of your nails and one of your inspiration for that nail art. If one photo is submitted, it must clearly show both your nail art and the inspiration your nail art in the one photo. Please don't make me sift through lots of photos and try and pick the best to represent your nail art. Please email your name, or the name you are happy to appear on my blog with your photo/s. You must also provide your country, so I know which random draw to include you in. I will post all entries on this blog for you to look at and for the judging panel to see. Please send your photo/s with a minimum size of 350 pixels height x 520 pixels width. I will crop photos to fit my site if needed. Minimum nail art area is four nails. Nail art can be done on false nails, as long as they are applied and photographed as a manicure. ALL types of nail art is acceptable. Stamping, freehand, decals, stickers, rhinestones, studs. You name it. ANYTHING. All I ask is that it be your own original work. 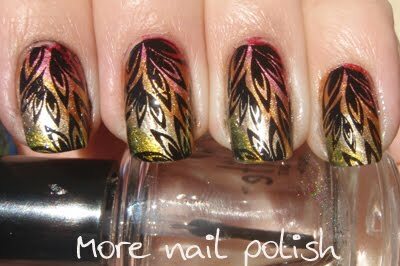 Nail art must be new and not previously posted on a blog or photo account etc. There will be no public voting, so someone with only a few friends will have the same chance of winning as someone with hundreds of friends. The judged winner will not be eligible for the random draws. This means three different people will get the Lynnderella polishes. The judges decision is final, but all entrants should recognize that individuals have different taste, and just because you don't win, it doesn't mean that your nail are is still not totally amazing. Thanks everyone. If you still have any questions, please ask below. Can't wait to do this! Thanks! Oh, I love nail art competitions! The prizes look brilliant too. I have a question though, should we refrain from posting the designs on our blogs after submitting them to you? Or can we post the designs and state that we've entered them in this competition? After they are post here, you are welcome to post them on your own blog. Sure, it can be inspired by someone else's mani. I'm happy to just to link to their photo/blog for your inspiration. ohhh awesome! Totally entering this one. Great prizes Cathy! You mean 2012 right, not March 11, 2010 :P I thought I stumbled onto an old post by mistake. Good God, what time warp did I go into? I'll just fix that right now. I was curious if we could do a different version of a mani that we have done before (that has been post on a blog). Yep, I think that would be ok. As long as it is different enough and has it's own twist. Of course! Excellent! Thank you! Yay a challenge giveaway! :) I'm going to keep my eyes peeled for inspiration everywhere. I've nominated you for the Versatile Blogger Award! Check it out! 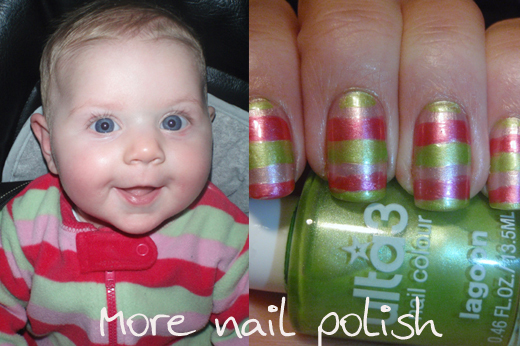 Just a quick question, if I have posted a pic on my Facebook account (new to the concept of nail blogging!) would that be a problem - it is only my personal FB account, not linked to anything to do with nails? I did mine on fake nails but they are too big for my nails. Can I just stick them on for the picture even though they don't fit?? Yes, as long as it looks like your wearing a mani that's what counts. can i post the pic i'm enterin on my blog after i've submitted it here? i'd link back to the contest of course. Great Idea!! Can I do a manicure inspired by a nature scene in a movie? can I participate if I don't have blog at Blogger, only account??? I found this with two hours to go! Talk about a rushed mani! where i can buy Lynnderella??? i really love this polish nail, but i dont know where i can found this. 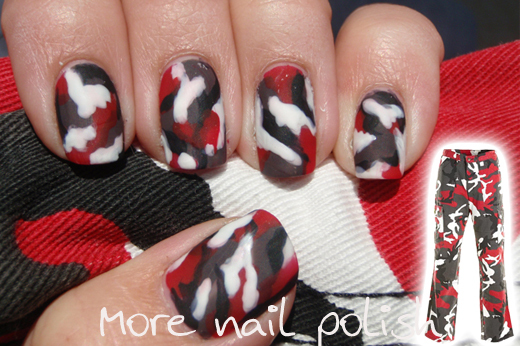 Check out the Nailasaurus latest blog post http://www.thenailasaurus.com/2012/06/load-n-vote-nail-art-contest.html . All you have to do is upload a picture of your nail art, the public votes, and the winner gets the Entire Essie Summer Collection!! !